Sorry for the lack of an outfit post this weekend, but my boyfriend visited me in London and I've got a French assessment tomorrow that I've spent today preparing for. The last instalment of my 'over-the-knee-boots series' should be up in the next couple of days and then I have quite a few outfit posts planned for upcoming posts. Anyways, as a sort of 'filler post' I thought I'd show you all my nails at the minute, they're still the same acrylics that I got done for my birthday but I've painted over the original colour with a glitter topcoat from Topshop. As well as making me feel all festive, the chunky glitter also works really well at covering up area at the base of my nail where my nails have started to grow. 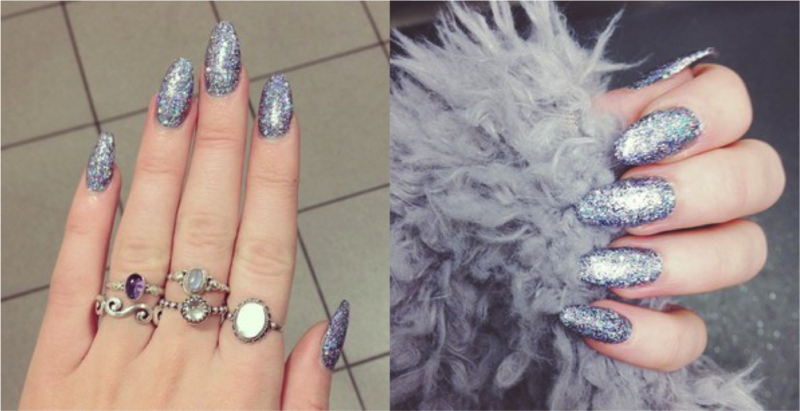 your nails look gorgeous, love that glitter polish! Ooh I love this nail varnish! Your nails are so gorgoeus! - jelous!! Stunning colour on your nails and your rings are so pretty. Totally swooning over your nails.. Hope that your French assessment went well!